Today we attached the last cable, zip-tied the last cord, and set the final acquisition setting… D-ICE is officially collecting data! It was a long two weeks, but together we pushed through motivated by our love for science and improving data quality and collection. It was a rainy last day, which was true to form for the general Barrow climate for the entirety of the trip, but it was completely tolerable and we got everything done that we needed done. We hope to have data and images posted to our D-ICE webpage next week. We are excited to see the results over the next year. 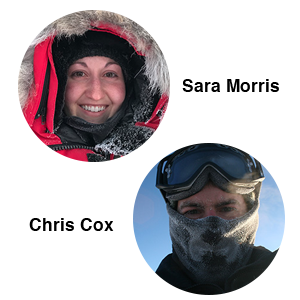 We’re Chris Cox and Sara Morris, two CIRES scientists in NOAA’s Physical Sciences Division. 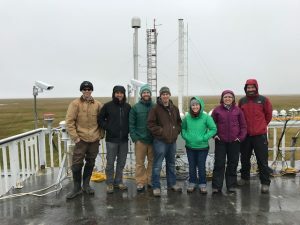 In August, we’ll be traveling to the NOAA Atmospheric Baseline Observatory in Utqiaġvik (formerly Barrow), Alaska to deploy a field campaign studying how icing conditions impact instruments. 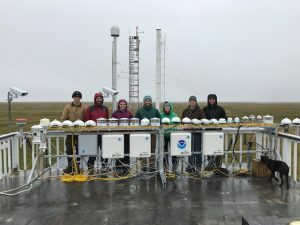 The instruments we’re investigating measure shortwave and longwave fluxes, and experience has shown that Arctic weather affects how these instruments operate. As team-leads for the “D-ICE (De-Icing Comparison Experiment)” campaign, we’ll examine the impact of icing on longwave and shortwave solar measurements for a full annual cycle in the Arctic. We’ll also evaluate how well de-icing systems keep instruments clear of ice and snow. For more information, check out the D-ICE campaign webpage.